There you can find Jen and Erica and all your favorite videos of them drinking it up. See you over there. Cheers! 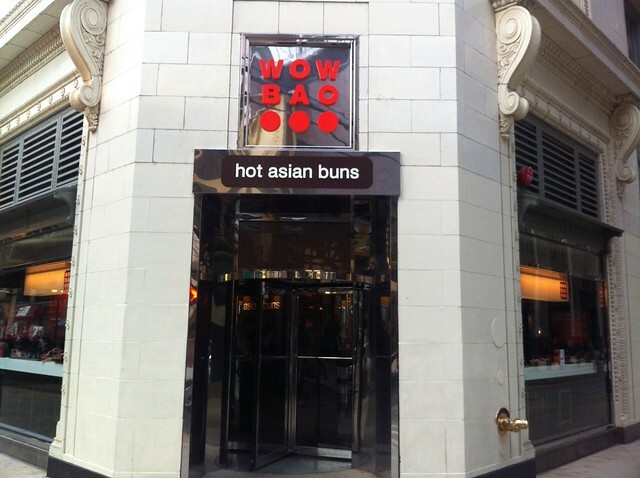 A bao is a steamed doughy bun with a filling and I remember when the first Wow Bao opened as a small stand in the lobby of Water Tower Place that sold little more than a small variety of bao, the thai herb broth soup, and a few drinks. 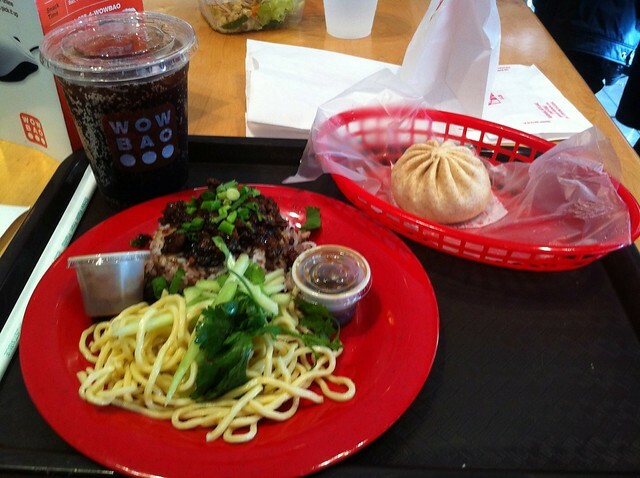 Now, Wow Bao is a small chain (5 locations, most in the Loop/North Michigan area) and the menu has expanded to more Asian foods. They have cashiers, but also have a self check out system that strives to be simple, but always leaves me with a nagging sense that I’ve done something wrong. In this case, my combo was called something like “3 for 5”, but I only had two choices. I figured out later that that was because the spicy peanut noodles (which were pretty tasty) were always included, but it might have been easier to have gone to the cashier who could have explained that, rather than me just wondering if I’d pushed the wrong buttons. Time: Walked into the Plaza at 12:51, standing at a table with a sandwich in 2 minutes. Meal: Pork loin sandwich with sauerkraut = $9 (plus I tipped $1 so that they’d ring the bell they ring when they get tips). Most stalls are cash only. I’m backlogged on writing up my Loop Lunching, but this is an important one to get posted because it’s my first seasonal lunch spot. 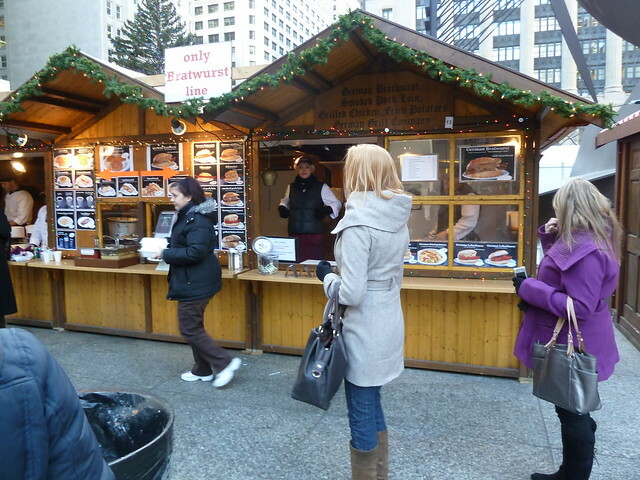 For the month between Thanksgiving and Christmas, Daley Plaza becomes a little German market, with stalls selling all sorts of handicrafts, Christmas ornaments, and sweets. There are also several food and drink stands. You can get beer and mulled wine in a boot (go early if you want a boot—they always sell out by early December). 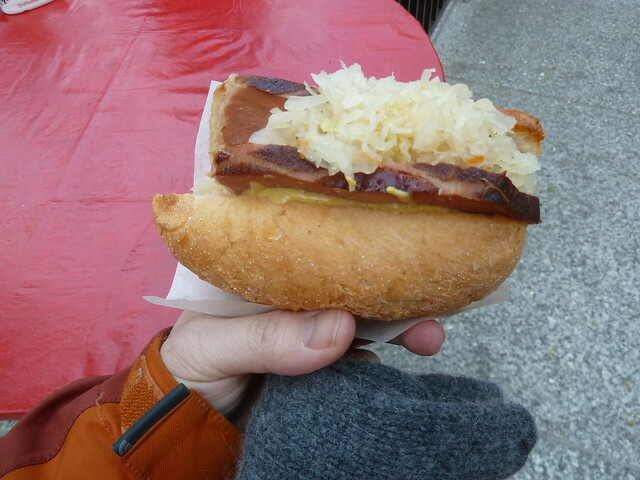 The food stalls have a variety of German standards: weinersnitchel, bratwurst, currywurst, leberkase, and today’s lunch, a smoked pork-loin sandwich. Erica and I have been making a date night of a trip to the Christkindlmarket for the last several years. And even when it was a bit of hike from my work to the market, I’d try to make it down for a lunch. Now that it’s just a few blocks from my office, I imagine I’ll be back several times in December. Can I count each different stall as a different entry for Loop Lunching? Here is a complete list of all episodes of Drunk Monkeys, for your reference!! Continue reading An Index of Drunk Monkeys Episodes!. Time: In at 12:18, seated with food in 22 minutes. 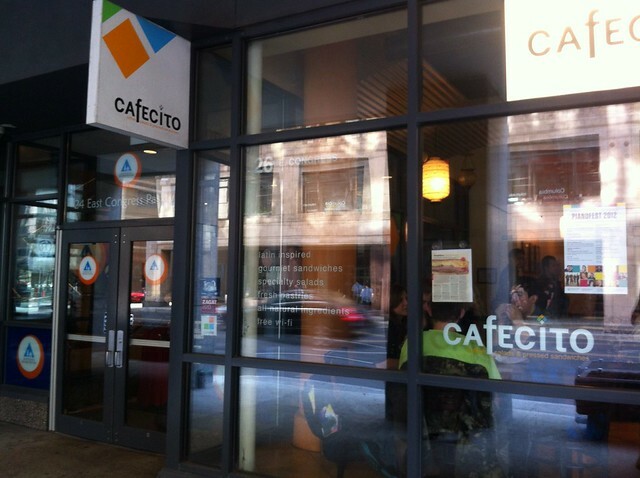 I owed a friend lunch and among the places she suggested was Cafecito and I leapt at it as a place I’d never been before. It turned out to be a fine choice, if nothing else because it’s pretty cheap. I’m glad I went with someone to talk to, though, because at 22 minutes this is now the Loop Lunching record holder for the longest wait. I’m a sucker for a soda I’ve never tried before, and Cafecito has multiple sodas I’ve never even seen. Yerba Mate Soda tastes… kinda like a tea soda. And as their name implies, they also have coffee drinks and breakfast sandwiches, so I might go back to try those. 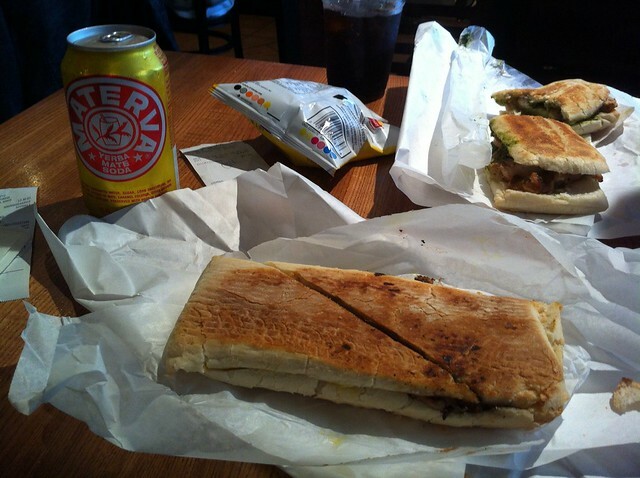 For this visit, though, I stuck with the obvious choice and got a cubano sandwich. I’ve had plenty of cuban sandwiches (two kinds of pig in one dish? I’m in!) but somehow eating this one made me realize that mustard and pickle are, while good condiments, kind of plain. My lunch companion got the chimichurri sandwich and said it was great. There are a lot of places open in the loop now that serve the food of various Mediterranean countries. I’ve heard them lumped together as “falafel joints”, though for most that’s just one of the foods they serve. I like the cuisine, whatever we call it, but it’s also true that a lot of the places all seem to have nearly identical menus. 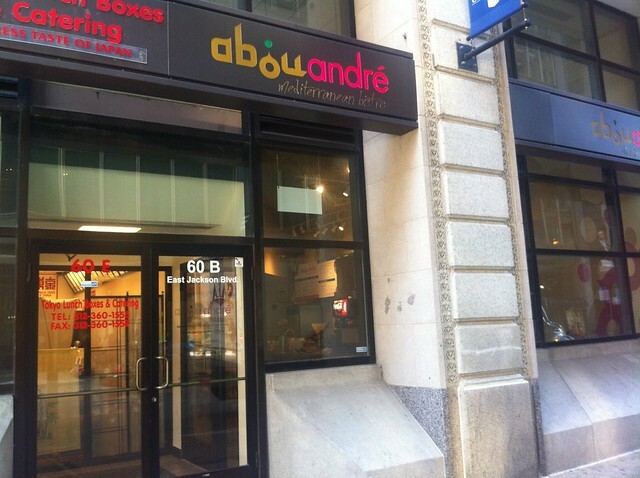 So that’s something I like about Abou André—there’s stuff on the menu I haven’t seen elsewhere. According to their web page, this is the sole American outpost of a Lebanese chain, so maybe that has something to do with it. 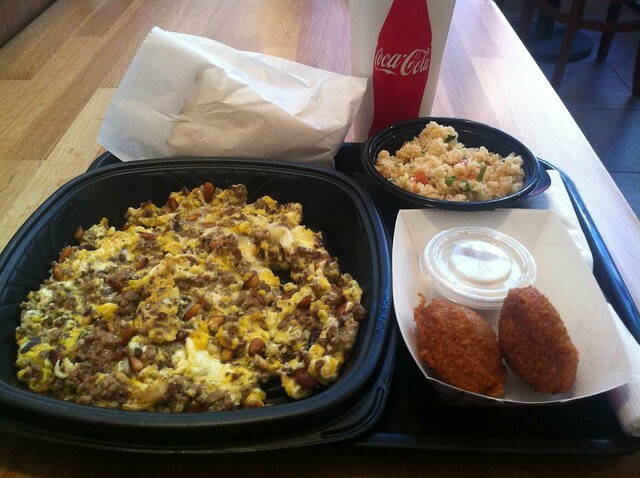 One of those unusual dishes is the Baid Qawarma: lamb and beef, eggs, and pine nuts all scrambled together. I like it with the hot sauce (not pictured, because I forgot to ask for it). I don’t know if was just because I was there after the lunch rush, but my two side falafels were patted and deep-fried to order, instead of coming out of a tub, and so were fluffy and delicious. I’m not sure why I got couscous as a side—it’s a pretty filling meal already and the couscous was a bit much. Usually I get the tabouleh. Time: In at 2:10pm, leaving with food in 2 minutes, 15 seconds. As I said when I went to Chipotle, I’m going to try to avoid chains on this project. But it is my work day, and so there are going to be days when I just need to grab something fast. 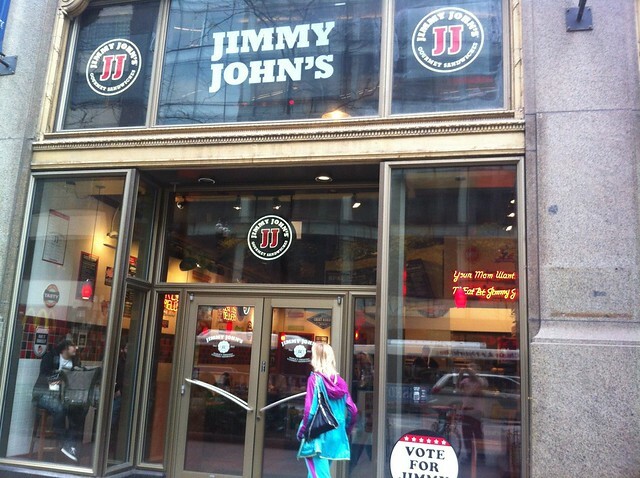 And Jimmy John’s does finish off my tour around the block* that my office is located on. And fast they are: the two minutes and fifteen seconds it took to get this sandwich and walk back out the door is the current Loop Lunching record. 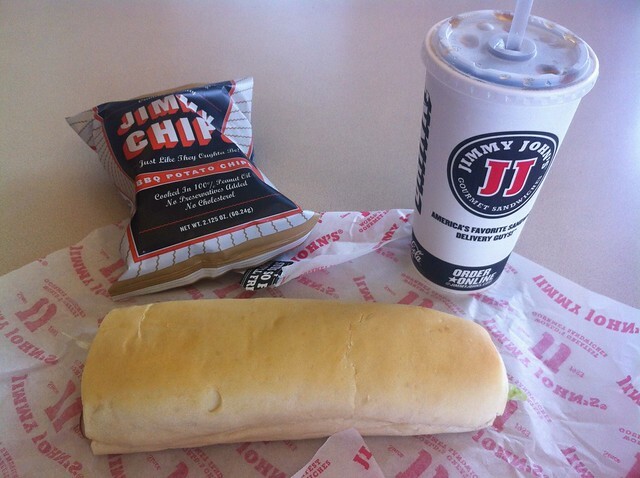 And, you know, I like a Jimmy John’s sandwich. Again as I mentioned in the Chipotle review, I like places that do something simple and stick to it. I think Jimmy John’s has had the same basic menu for years. I remember it being a big deal when they added bacon to the possible ingredients, and that was like five years ago. Time: I arrived at mid-lunch rush, 12:30pm. I goofed up on my usual system for timing the line, but it was just over 10 minutes from the front door of Macy’s to sitting with food. I broke out of my immediate neighborhood (by a whole 3 blocks) to meet an old work colleague for lunch. 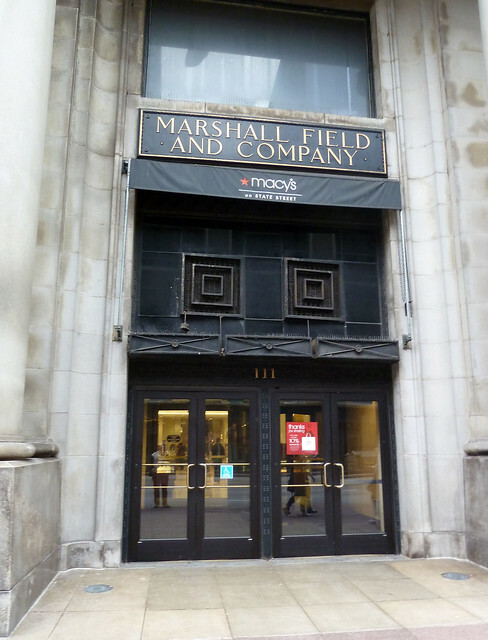 We met up on the seventh floor of Macy’s (nee Marshall Field’s) where there’s the Seven on State high-concept food court. The concept is celebrity-chef-designed food courts stands, so there’s Rick Bayless’ Frontera Fresca, Marc Samuelsson’s Marc Burger, and Takashi Yagihashi’s Noodles. 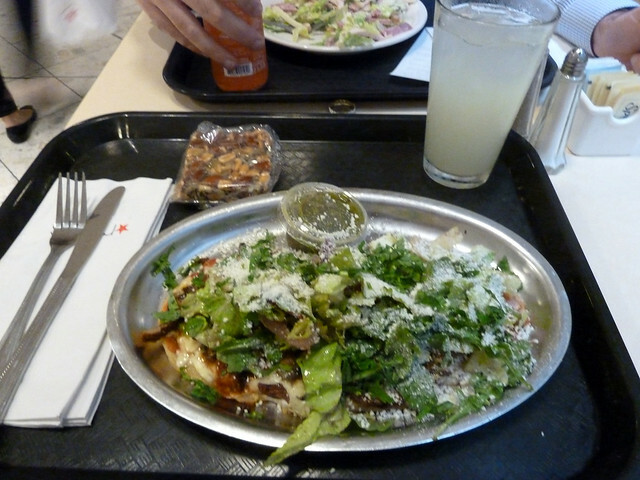 There’s also a salad and soup place that is just… salads and soup. There are two other Frontera Frescas in other Macy’s—one in Skokie and one in San Francisco. I’m not ashamed to be a Rick Bayless fan. I’ve eaten at Xoco quite a bit, and Frontera Grill whenever I can. The Frontera Fresca was closed for renovations the last time I was here, but is open again. I’m not sure the renovations made any huge difference to the decor, but they seem to have made some changes to the kitchen flow, as there was quite a line, but once I had ordered, I had my food in minutes. It felt faster than the wait from order to food had been in the past. I’d recently had huaraches from a place near my home and so I decided to try Bayless’ take on the food. Delish. Just great. My lunch companion had a salad from the salad place. I don’t believe he starved to death. Time: In the door at 12:40pm, walking out the door with food in 2.5 minutes. Chipolte is a small local chain… ha ha! I crack myself up. So here’s the deal. There were only two restaurants left to complete a full circuit of the block my office is on, but both are national chains and so I was going to skip them in favor of branching out for more local, and interesting, fare. But then it was pretty rainy at lunchtime and work was busy enough that I just wanted to grab something quick and come back, so I popped into the Chipolte that’s right next door (don’t be creepy). There’s a divide in chain lunch places that I see in places like Quiznos and Subway vs Potbelly and Jimmy Johns. It’s about either doing, like the latter, a few ingredients and doing them well and sticking with it, or like the former, constantly coming up with changes to your menu to entice customers in. Chipotle in definitely in the latter camp. They do four meats, a couple of salsas, two kinds of beans and rice, and however you can combine those things in tortillas, tacos, or bowls. I do have to say I’m a fan and I’ve got an order that I’ve got down, which is part of that very impressive 2.5 minute service time. (Bowl, brown rice, pinto beans, carnitas, some tomato salsa, some corn salsa, cheese. Clear!) They have Coke products on the fountain, but they have pretty good iced tea and non-diet lemonade on the fountain, so I usually make an Arnold Palmer. I’m a fan of local, interesting, and different. 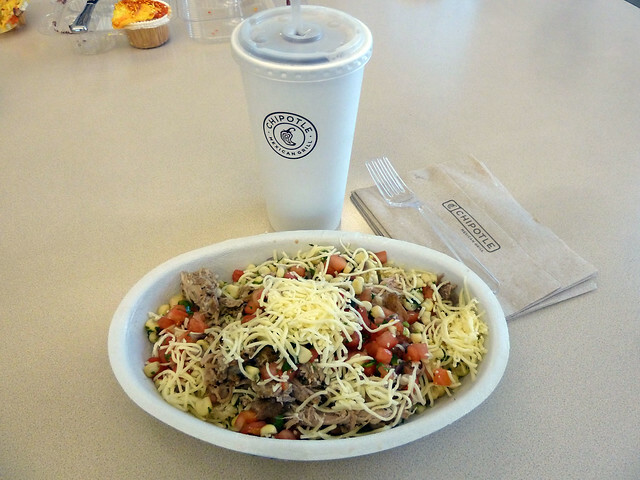 But if it’s a rainy day, Chipotle is just fine by me. 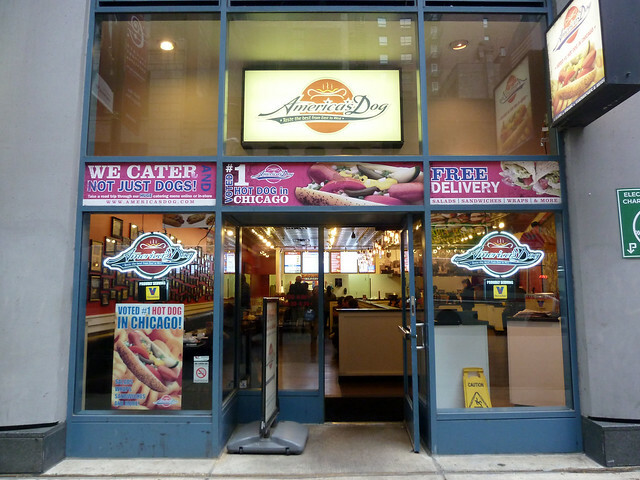 America’s Dog is another small local chain (4 locations in the city, one at O’Hare*). Their schtick is that they have 21 hotdogs named after cities around the country and that each represents the cuisine of that area. I’m not sure I’ve ever seen “BBQ sauce, grilled onions and tomato” on a hot dog in New Orleans, but sure. They have a “road trip” card where if you eat 18 of the hot dogs you get a tshirt and your photo on their website. I’ve eaten at their other locations, but I left my card at home this time. They also have Belly, so I did check in on that. America’s Dog, it’s obvious, has ambitions for expansion and the place is a half-step up from a usual Chicago hot dog place. If you want a Chicago-style hot dog in downtown Chicago, this will be the cleanest place you can get one. But, I’m sure I’m going to be eating plenty of hot dogs on this journey around the Loop (and don’t get me wrong, I love a Chicago-style hot dog) so this visit I took advantage of the other selections on their menu and got a chicken sandwich. The cashier asked me what I kind of cheese I wanted on the sandwich and rattled off the choices, so I went with cheddar. It wasn’t until I was sitting down that I realized one thing and remembered another. When I looked at my receipt I realized that cheese was a $0.50 add-on and not standard on the chicken sandwich. And when I tasted my sandwich, I remembered that cheese on a chicken sandwich is gross. 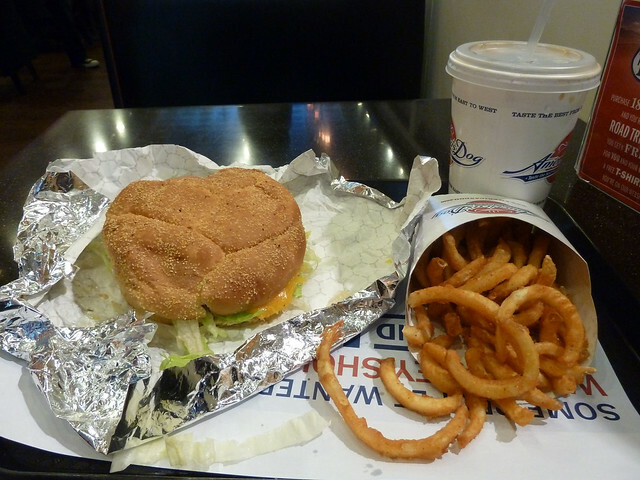 Other than that, the sandwich was fine and the curly fries were great. The fountain selection was Pepsi, so I went for iced tea. There were two spigots on the ice tea dispenser, one un-labeled and the other labeled “unsweetened tea”. I assumed, therefore, that the unlabeled one would just be sweet tea. In fact, it was the syrup that you would use to make some sort of Raspberry iced tea, diluted just a bit from its raw, syrupy state. Nasty. I poured out 3/4 of the cup, filled it back up with unsweetened tea and it was still strong and sweet. *Which is technically within city limits, but you’re not going to just stop in for lunch.